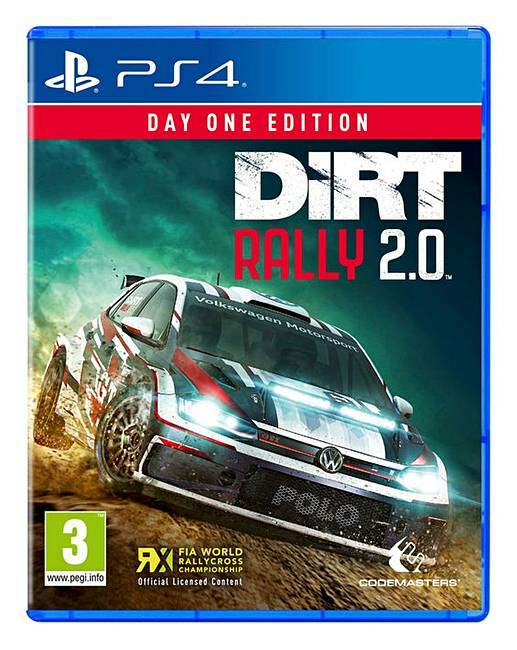 Dirt Rally 2.0 dares you to carve your way through a selection of iconic rally locations from across the globe, in the most powerful off-road vehicles ever made, knowing that the smallest mistake could end your stage. You will need to rely on your instincts with the most immersive and truly focused off-road experience yet, including a new authentic handling model, tyre choice and surface degradation. Power your rally car through real-life off-road environments in New Zealand, Argentina, Spain, Poland, Australia and the USA, with only your co-driver and instincts to guide you. Race on eight official circuits from the FIA World Rallycross championship, complete with licensed Supercars and support series. Develop your team and cars around race strategies, and progress through a varied selection of Events and Championships in both a single player Career Campaign and a competitive online environment. We aim to deliver your order within 1 working day, providing that the items are in stock at our own warehouse, or by the time indicated if being despatched directly from our supplier, larger items requiring 2 man delivery will be booked in for delivery by the carrier after despatch.